This was the last book in my monthly challenge and, quite frankly, my eyes need a break! It was a satisfying month in that I did read 10 books that had (mostly) been sitting around for quite some time. I can go to the Friends of the Library used book sale Friday in good conscious. Yay! I think the most slamming lie that I have recognized more and more is that it is wrong to have a large family. She addresses the issue of the family and how Satan has attacked us at the very core -- by convincing us that it is wrong to have one in the first place! Think about it. Abortion. Family planning. Careers. Budgets. It gets sticky. I'll be one of the first to suggest that if you cannot afford a family of 12, you might want to reconsider (if that was your plan). Obviously, we need to care for what we have. If I can care for five -- make sure they have the food they need to eat and the clothes they need to wear -- but can't afford the tenth -- then I'd be forced to pray about it. We don't need to bring children into the world just because we can. But because we're called to. There IS a difference in what I just said. I'll let you figure it out. Or argue it out, if you feel you must. It has surprised me that, after having my first, I get asked if I plan on having anymore. It is asked in such a way as to suggest that one is enough or that they believe that after birthing one, I wouldn't consider another. I'm always curious how they've already jumped to that conclusion. We hope for siblings around here! (BTW, I am NOT saying it is a sin to have one. Each family has to make this decision for themselves. I am merely arguing the point that Satan does seem to like to use the "overpopulation" card in convincing us to forgo families all together.) Satan doesn't have to fight against the family that doesn't exist. That's all I'm saying. At any rate-- this book was interesting and I WOULD recommend it. I think DeMoss addresses a lot of important issues and she does so tastefully. It's worth considering the read. Sounds like it might be good as a conversation starter. Thanks for reviewing it - I'll have to find a copy now! I read it several years ago before it was a "fad" book (which is a good thing because I would so have brushed it off). I think the biggest thing for me is to get my brain to convince my heart (and subsequently inform my behavior and actions) that God really is love/loves me. Functional atheism is what I call it. I know in my head that God is all loving, all powerful, and all knowing but my actions say otherwise. Ah, heaven is going to be awesome. This whole sanctification process gets a little exhausting sometimes. As interesting as this book sounds, I'm a little disinclined to read it for fear I might have too many arguments with it. 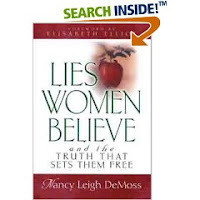 Couldn't the argument be made that one of the current "lies" women are believing as part of a new trend among certain Christian groups is that they are supposed to have a large family? I fell for this one before I realized that God doesn't bless everyone the same way. I have no children, and my husband and I could be completely content with that. And I like kids. But it's not really about whether or not I like children. If God gives us a child--that is, if we feel that the time comes for us to have children--so be it. But if we never feel a peace about it, I can't say that I'm going to jump on the bandwagon of "now we're married, so we'd better have kids." For me, one just doesn't follow naturally from the other. This is one of my favorite books of all times. I didn't agree with every single point the author brought up, but I really enjoyed reading her reasoning and she brought up some GREAT points. Laura - yes, it is a good conversation starter (and ender, too, if you aren't careful). BLF - Of course, I know where you are coming from. However, my remarks on this particular lie were very....particular. The majority of the population falls prey to the lie that the world is overpopulated and thus no one shoudl be thinking of having a large family. I expanded on that point (because I know a few people) that some people believing having ANY kids is flat out wrong. Family planning, over populations arguments and the like. You know how it goes. My point is what I said: It's much easier on Satan to not have to worry about attacking a family that doesn't exist. MM- No, I haven't read any of her other books! I really don't know anything about her. Would you recommend another title in particular? I LOVE this book! We've been reading it in a Bible Study and it has been absolutely wonderful in helping me fine-tune areas of my life. I don't necessarily agree with EVERY point she makes, but most of them are right on! She addresses a lot of things that other people are afraid to touch. Truth is truth even if no one believes it. I highly recommend this book for anyone who wants to grow in their Christian life. I just wish the scriptures were KJV.